• Opening Bash: Saturday February 21, 1-5pm. • Brewers Choice: Tuesday February 24, 6-10pm. • Closing Beer & Brass Brunch: Sunday March 1, Noon-4pm. The festivities kick off on Friday, February 20, with Opening Tap, a plethora of special and rare beers tapped at participating venues across the city. And there will be events throughout the five boroughs over all ten days: special pourings, tap takeovers, beer brunches, food pairings, and much much more. Check out the website for additional events, and be sure to check in with your NYC local hangouts and favorite NYC breweries for what they will be offering. It'll be a great ten days. Celebrate NYC and craft beer! THHG & Planet Princeton: A Pub Crawl to raise money for Homefront! Jacob Marley said it best: "Business? Mankind was my business. The Common Welfare was my business. Charity, Mercy, Forbearance and Benevolence were ALL my business!" So how can you do your part for Mankind this holiday season? By raising a glass with The Happy Hour Guys and Planet Princeton, of course! 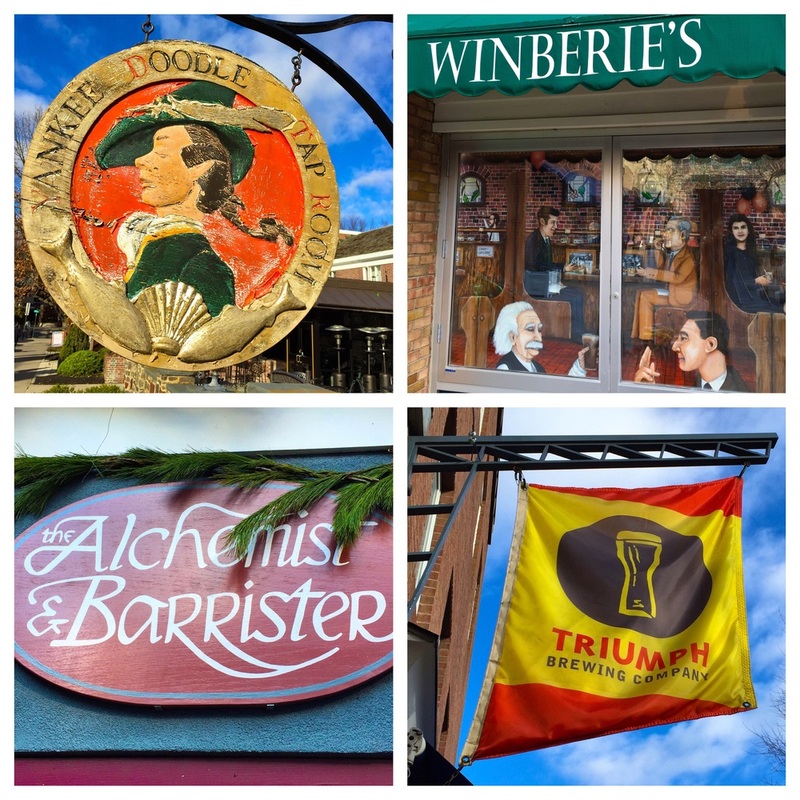 The Yankee Doodle Tavern, The Alchemist & Barrister, Winberie's, and the Triumph Brewing Company. Throughout the evening there will be history and tidbits about each space (and other fascinating things) led by Jimmy, along with raffles, door prizes, and other fun to raise money for HomeFront, a charity that is working to end homelessness for New Jersey families. Come do your part to help this holiday season, and in the best way possible; by raising a glass with new friends. Hope to see you there! Video #278: Artsy's Craft Report - Queens Beer Week! Hello from NYC and specifically the borough of Queens! The beer scene is booming in this borough and there's a celebration in the works: the inaugural Queens Beer Week! Hit play for all the deets from myself and Dan Bronson. It's gonna be good y'all! Video #275: Artsy's Craft Report - NYC Beer Week 2014, a preview! Reporting for The Happy Hour Guys, Squigs gets the lowdown on this sixth annual celebration of craft beer in New York City. NYC Brewers Guild members chat about the week, the events, and what's so special about the NYC craft beer community. Oh, and we may play charades a little. Cheers! Some love from the @FilmAnnex community! Jimmy had the chance to do a quick interview with the good folk of Film Annex, (one of our video carriers) the other day, and it's getting quite a bit of traffic. Treat yourself to some inspired reading, and while you're at it, if you're a video creator, you might want to look in to them. Great folks, great system. Here's the link to our interview. Video episode #258: THHGs are traveling the BEERmuda Triangle! Join Mark, Jimmy, Joe and AJ as the intrepid Happy Hour Guys team up with their pals at Bagger Dave's Legendary Burger Tavern for a series of episodes that travel all through the BEERmuda Triangle: Greater Detroit, Western Michigan, and Indianapolis, stopping off at terrific Craft Breweries and Bagger Dave's stores along the way. This trip will be EPIC! Now, put on your thinking caps and your artsy pants. We need one idea that will put this bar over the edge into magnificence. It can be anything. Unique glassware, handmade furniture, gadgetry. The more imaginative the better! The kicker is, that we will choose one idea to present to George Dickel and if our entry is selected we will share with you 8 of whatever the winning idea is, built especially for us and the bar. Have at it Nation! We know you have it in you!